If you’ve ever been outdoors at night, with a moonless sky above, and attempted to find your way without some sort of light…you know how difficult it is. Imagine the same scenario, but this time you are in a boat in waters you are not familiar with. You are attempting to safely enter a harbor. That’s a bad situation to be in. Well, that’s the point of lighthouses – as they help guide your way to safe passage, showing the path you should be on. 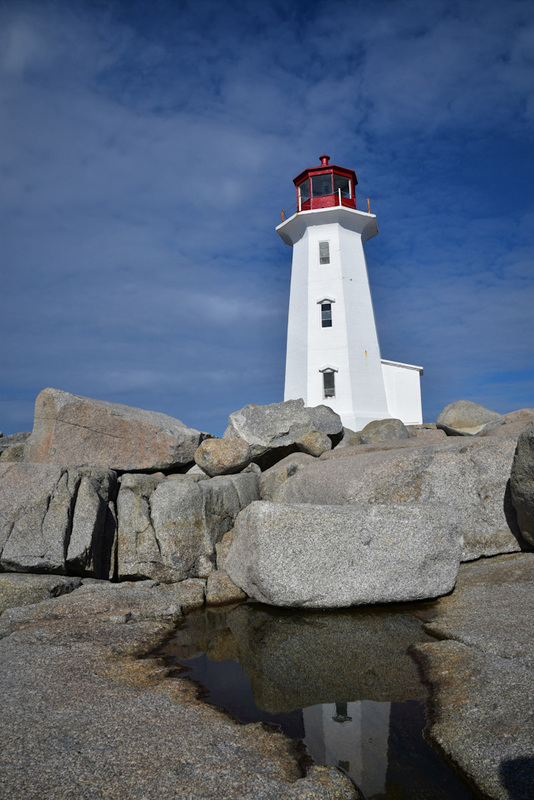 This particular lighthouse is found at Peggy’s Cove, Nova Scotia, Canada. * I was fortunate to be able to travel up in that area, during the fall colors. The whole area is beautiful, and I get drawn to lighthouses no matter where I am. Our lives are very similar to the issues sea captains face. In situations like this, we both are in desperate need for a guiding, visible light. Something that will help us steer in the right direction. Not only does this text give us the reassurance God provides the light so we can follow the safe path, but we also see what happens when we STAY in the light. We are with HIM and are able to walk with fellow believers. This text should give us the strength to stay true to the one path He has set before us. It’s not just the light shining from a rock, helping to guide the ship safely. No, this light has our Creator walking with us, guiding us, loving us, putting others around us to not only find the destination, but have comfort during the journey. As you walk through life, be mindful of the visible light that is before you, showing you the correct path.